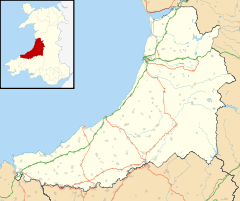 Llanddewi Brefi (Welsh pronunciation: [ɬanˈðɛwi ˈbrɛvi]) is a village, parish and community of approximately 500 people in Ceredigion, Wales. In the sixth century, Saint David (in Welsh, Dewi Sant), the patron saint of Wales, held the Synod of Brefi here and it has borne his name ever since; "Llan" referring in Welsh place names to a church or holy place. Llanddewi Brefi (Welsh, meaning "Church of David on the [River] Brefi", the Brefi being a tributary of the River Teifi), is one of the largest parishes in Wales. The grade II* listed parish church of St David dates from the 12th century, on a site associated with religious worship since the 7th century. Fragments of much older buildings are incorporated into the Norman church. The church contains a modern statue of Saint David and a collection of Celtic crosses. When the Synod of Brefi was held in the village in the sixth century, it is said that the small hill upon which the church stands marks the spot where the ground was miraculously raised up under St David so that he could be heard better at this synod. In addition to the Anglican church, there is a non-conformist chapel, two pubs and one village shop. The village and the surrounding area are largely Welsh-speaking and the local economy is dominated by sheep and dairy farming. A mile (1500m) to the south-west and still within the parish is Pont Gogoyan, also a grade II* listed structure over the River Teifi. In 1977 the village was the scene of one of the world's biggest ever raids involving the drug LSD. Over 6 million tabs of the drug were seized as part of Operation Julie on 26 March of that year. The village is the home of the character Daffyd Thomas in the comedy series Little Britain. ^ "Community population 2011". Retrieved 19 April 2015. ^ R. J. Thomas, Enwau Afonydd a Nentydd Cymru (University of Wales Press, 1938. Reprinted: ISBN 0-7083-0331-5), pp. 129-130. ^ "Pont Gogoyan, Llanddewi Brefi". British Listed Buildings. Retrieved 18 December 2013. Wikimedia Commons has media related to Llanddewi Brefi.